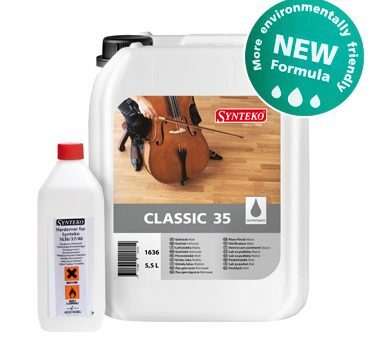 Synteko Classic is a fast-drying, two-component, acid-curing hardwood floor finish for interior use based on modified amino and alkyd resins in a solvent mixture. This finish has an amber colour, enhancing natural wood colours. Synteko Classic delivers an extremely durable, long lasting beautiful finish. Suitable for finishing of hardwood and other timber floors in residential as well as in commercial areas offering excellent grain clarity, depth and colour. Synteko Classic acts as its own sealer has excellent workability properties and fast drying time provide the benefit of one-day job application. Synteko Classic complies with the latest VOC rules in Europe.